Diving is one of the most varied sports one can imagine. In the beginning, it is the colorful fish and warm waters that inspire new divers. But after some years, for many divers, this is not enough. For these divers, wreck diving and cave diving offer exciting alternatives. If you are interested in both, a whole new exciting world can also be found in mines and mine diving. Indeed, throughout Europe, there are various mines that have been opened up for mine diving. 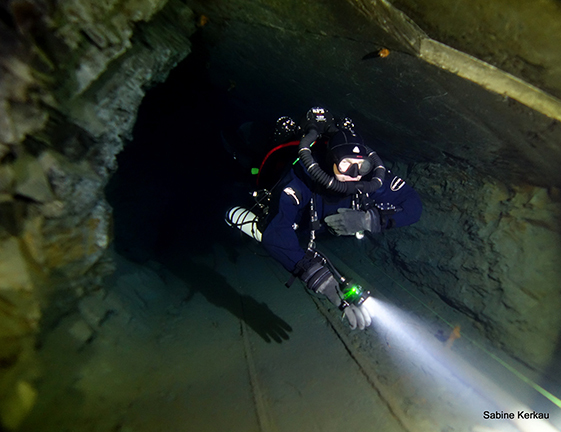 Technical diver in Chrstine slate mine of Willingen in Sauerland, Germany. Photo by Sabine Kerkau. Personally, my real passion is diving deep wrecks; however, due to weather, most wreck expeditions only take place between May and October. So, some years ago, I came up with the idea of pursuing cave diving. It’s pretty nice, but for me, in the long run, it’s too boring. For me, there’s just too few scraps of things to discover in caves. I was about to give up cave diving when I received an invitation from Sweden to write an article about a disused iron ore mine in which a group of ambitious technical divers made a very interesting dive project. This first mine diving experience was so impressive that I am now looking forward to the cold season with several mine dives, in addition to some wreck expeditions in the summer months. One of my absolute favorites is the Christine slate mine of Willingen in Sauerland, Germany. At least once a year, I am drawn here, and each time, it is as exciting and impressive as the first. The Christine slate mine was shut down in 1971. Until then, the mine supplied slate for nearly 100 years. Even today, in some parts of the surrounding area, you can still see churches, houses and walls built with or covered by slate. The old slate mine has now become a tourist site. Guided tours regularly take place in the dry part of the mine. The air temperature is 8°C all year round. The second and third levels of the mine are flooded. The second level is at 23m, the third at 41m. Both levels are well-drained. Covering a distance of 1.2km, trained cave divers can explore the impressive underwater world of the mine. Shoes, bottles, tools, minecarts, rails and much more can be found in the long corridors and tunnels. The visibility is usually good. The first challenge a diver new to the Christine has to face is finding the entrance to the mine. This is because it is quite hidden behind a row of buildings on the outskirts of Willingen. With a map in hand showing the mine’s location, you walk along a narrow path that ends in front of a massive door, which looks a bit like a cellar door. Inside, in a small vestibule, there are tables for storing the equipment. From there, the path goes a few steps down to the entrance of the mine. Running alongside the steps are rail tracks that follow ramps, which descend to the surface of the water. At the end of the ramps, there are old minecarts. Depending on how many divers have already dived that day and how well they have kept from stirring up silt, it may be that the visibility is not that good up to this point. But visibility usually changes abruptly for the better when you arrive at the first level. The passages of the first level are wide and there are no bottlenecks that cannot be overcome, even when fully kitted up with dive gear. Much of the mine has a permanent dive guideline. But, unlike most caves, there are many corridors in mines, and one has to pick one or the other. The great thing about the Christine mine is its fantastic scenery, and the many artifacts that can be found left in the mine from the days when slate was mined there. If you stay in the first level, then with a good dive plan, there is no problem in doing a non-decompression dive. In most cases, the first dive will be a guided dive, which will add to the diver's safety and ensure that one has seen the best spots. With the right guide, I can guarantee that everyone who dives here becomes a repeat offender. Here’s a bit of advice acquired through recent experiences. I love mine diving and look forward to my next visit to one of these wonderful time capsules; however, in order for such unique dive sites as the Christine mine to remain open, pristine and inspiring to many a diver, it is important that we all abide by the rules. A mine should only be dived with suitable equipment and training. Even if mine diving operators try to do everything in their power to make sure that only properly trained, prepared and equipped divers get diving permits, only each one of us can decide for herself or himself whether she or he really is in the best physical health and mentally prepared enough for such a demanding dive. If you descend into the depths of mines and caves, you should be able to master your equipment while you are asleep and completely blind; and, in any situation, you should be able to control your buoyancy. You would not climb Mt. Everest in bedroom slippers and without any preparation, would you? If an emergency occurs underwater, the way out may be long. Every diver should know how to react in such a situation. In the Christine mine, courses for the practice of emergency scenarios are offered. Mastering these saves lives, which has recently proven itself on my own trip to the mine. Use the opportunity then to learn from my own experience. More information is available at: toms-tauchshop.de. Sabine Kerkau is a German technical diver, dive writer and underwater photographer based in Switzerland. Kerkau was inducted in the Women Divers Hall of Fame in 2019. For more information, please visit: Sabine-Kerkau.com.